Adam Egypt Mortimer takes a stand against bullying in his feature film debut. The irony is he bullies viewers into sharing in his frustration using a relentlessly clichéd, propagandistic approach to make anyone watching feel really, really bad. Someone has to do the job of course, because the acting department can’t. 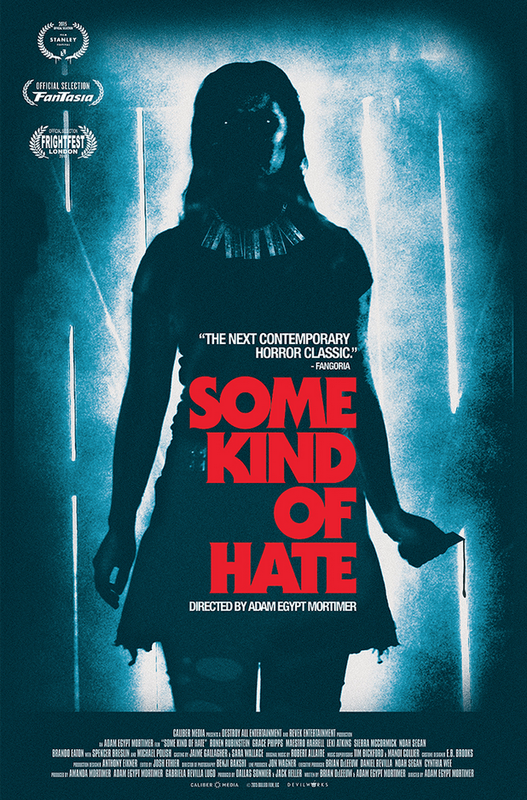 The comic book writer and short film director blends elements of real-life horror with a sprinkling of supernaturalism to produce Some Kind of Hate, a brutal and bloody take on the physical and psychological effects on targets of aggressive bullying. The cause is noble, but unfortunately the end product is so in-your-face it has an adverse effect. I found myself, especially circa the blood-soaked climax, cheering on neither said supernatural element nor the good guys, but rather the time marker on the film’s total runtime as it neared the end. Go! Go! Go! The film starts off on the wrong foot and has to fight an uphill battle over the course of 80 minutes, sending its quietly angry protagonist Lincoln (Ronen Rubinstein) down a gauntlet of seemingly endless taunting and physical confrontation. We first see him getting intimidated by his loser father (Andrew Bryniarski) before leaving for school, where he’ll immediately get bullied by some dude with a tucked-in shirt. A crowd quickly gathers around the scene to make the incident as humiliating as possible. When Lincoln can no longer take it he reacts, rather brutally, which sets up the events of the rest of the movie in a fairly compelling fashion. He’s sent to a reform school in the middle of the desert where the counselors hope to unpack many of their campers’ issues and help them move forward with their lives. Surprise surprise, Lincoln doesn’t find any sanctuary from his problems here either, as one of the campers takes it upon himself to make the new guy feel ‘welcome.’ It’s not until Lincoln retreats into the basement of one of the facilities that he finds some kind of solace from the hell that has become his life. But there’s something else down there waiting for him, watching him. Chief among the issues facing this would-be-thriller is the frustrating lack of exposition regarding this reform facility, weirdly named Mind’s Eye Academy. The remote, arid location is certainly foreboding but there’s no lore, no exposition, no explanation. The camp leaders, themselves victimized by various forms of abusive upbringings — Michael Polish’s Jack and Noah Segan’s Krauss — are so vaguely defined that their creepiness comes across as a byproduct of nonexistent character development. Jack appears to enjoy meditating and speaking in hushed tones, while his underling isn’t sure what good the Mind’s Eye Academy is doing for anyone. Quite incidentally, neither are we. All we know is that this place serves one purpose and one purpose only: to stage some bloody scenes of supposedly justifiable revenge. Some Kind of Hate rams its social commentary down your throat. Not only that, but there comes a point where the message becomes obscured by something more alarming: bullies may be bad but worse are the victims who don’t stand up for themselves. Grace Phipps’ troubled former cheerleader Kaitlin tries to convince Lincoln of this, and though he’s the closest person within earshot it’s evident she’s preaching to us. All of a sudden fellow campers start disappearing. That’s right folks, ‘innocent’ people are getting killed to death. Is it Lincoln? Lincoln seems to be the only one around here with a big enough chip on his shoulder to warrant suspicion. Look, I’m all for a vicious revenge plot, if it’s executed well. (I admit that may have been a poor choice of words.) Few things are more gratifying than watching the baddies receiving their comeuppance, particularly when it’s been coming to them the entire time. Annoyingly, the film’s latter stages justify little more than the film’s quota of supplying the red gooey stuff. Some Kind of Hate had a message to send, but unfortunately it all gets lost in a production that is some kind of awful. Some Kind of Hate! is released on VOD in the UK now through FrightfestPresents. Will you be checking it out? Let us know in the comment box below! “executed well”, ha! I kinda dug this picture, but only kinda. It’s definitely a mess in terms of both its structure & its message.